On this date in 1801, four Jacobins were executed in Paris after Napoleon’s secret police entrapped them into a plot against the First Consul. After seizing power on the 18th Brumaire (November 9, 1799) the new man on horseback needed to consolidate power against the opposition of both royalist and Jacobin opposition. It would prove to be the case that the latter were the declining force and the royalists were the ones in it for the long haul. But it had not been many years since the Jacobins were the power in Paris, and Napoleon was a proactive type; his 18th Brumaire coup had been effected on the pretext of a phony Jacobin conspiracy. So instead of just waiting around for the attentats aimed at his person, Napoleon set his police chief — Joseph Fouche, the onetime “Executioner of Lyons” — to spin them up himself by the offices of agents provocateur. The so-called Conspiration des poignards — Conspiracy of Daggers — was one of Fouche’s triumphs. Here, a police plant named Harel goaded several radicals into kind of supporting (or at least not resisting) his plot to dagger the Corsican at the opera in October 1800. “It was agreed to exaggerate the danger to which it was appropriate to the First Consul to have been exposed,” wrote the French diplomat Bourienne in his memoirs. Harel himself had to distribute the weapons. Though the daggers conspirators would probably have been happy to see Napoleon dead, they were so little inspired to achieve that death by their own hands that most of them quailed to appear at the scene where the trap would be sprung. They ended up being arrested in their homes. The Death of Caius Gracchus, by Jacobin artist Francois Topino-Lebrun (1798). 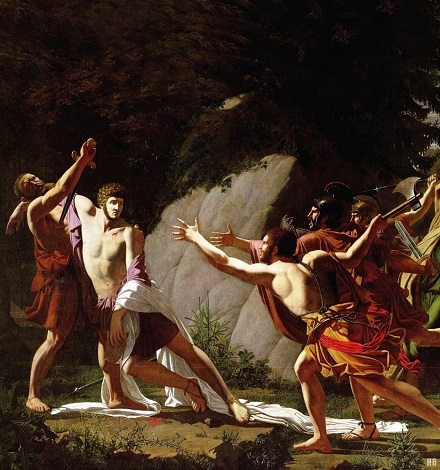 The painting’s contemporary allusion was to Gracchus Babeuf, recently executed (after an unsuccessful suicide attempt in the courtroom) for the Conspiracy of Equals. The artists implicated were both associates of Jacques-Louis David (and the opera being staged was one inspired by David’s The Oath of the Horatii). David had already by this time proved himself a willing lackey of the new regime, but the resulting brush with police scrutiny (David had to testify at the trial) surely underscored to the opportunistic painter that his own revolutionary past could be dropped on his head like Damocles’ sword at any moment Napoleon should choose.